I'm trying a new feature on book-a-rama. I hope you like it. Brand new books get all the attention but what about those lonely wallflowers, those old pals 'on the shelf' just waiting to be asked out on Saturday night. I'm talking about old books. They might be dented, stained and possibly smelly but let's not hold it against them. They were once like those shiny new ARCs or just released titles once upon a time. Let's give them a little love today. 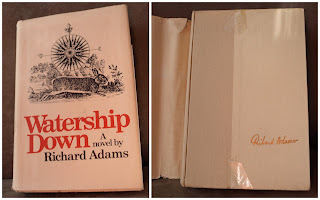 My first title is Watership Down by Richard Adams. I recently reviewed it and enjoyed it. My copy is a discarded library book bought at a sale a few years ago. I think it cost a buck. It's not in bad shape for a library book either. The dustcover is still intact with just a bit of a tear. It held up well even after bouncing around in my trunk during my Toronto trip. It's now resting quietly back on the bookshelf. How about you? Do you have an old favorite you want to give a shout out to? Leave some love in the comments or feel free to blog about it yourself. This is a great idea for a feature! Watership Down - top 5 favorites of all time for me! Good idea! I review books (erm... try to review books -- I often don't get around to it) that I recently read; those can be oldies! But never old books that I read a long time ago. I'll think of one to put in the spotlights! I loved Watership Down btw; I'll make a picture of my copies (yes, plural!) soon. Christine- It's a great book, isn't it? Gnoegnoe- That's awesome that you have more than one copy! Since I adore rabbits, I'm always a little surprised when someone reminds me of Watership Down. It's on my bookshelf, waiting... Thanks for the reminder. This is a great idea for a new feature! An old favorite of mine is Little Women. What a great idea! I'll have to scan my shelves and decide which book(s) to give a shout out! It's a fantastic idea. A lot of my books are old, out of print ones because I frequent library sales just for the purpose of finding such old books. Funny thing is, I own two other books by Adams, Maia & Shardik that are old and who knows maybe I'll even talk about them on my blog. I love this backlist feature! Great idea!